Diane von Furstenberg speaks to the press at opening of Impact: 50 Years of the CFDA. Oscar de la Renta speaks to the press. I was so excited to see him! Mr. de la Renta said John Fairchild, the publisher of Women’s Wear Daily from 1960 to 1996, was another huge promoter of American fashion in the early days of the CFDA. Left to right, Tory Burch, Yeohlee Teng, and Mary McFadden (looking so old school glamorous in a full length fur coat and beret!). Donna Karan spoke of the mentorship aspect of the CFDA, with older designers helping the younger ones. “I wouldn’t be here if it weren’t for Anne Klein,” she said. Karan worked for Klein early in her career. Each of the approximately 100 garments and accessories on display was chosen by a member-designer as the most representative of their work, and the exhibit as a whole is a stunning testament to the breadth of American design and the rich heritage young designers of today have to inspire them. A Mary McFadden ensemble from 1979. Detail from the McFadden ensemble. Look at the color, look at the pleating! A 1985 Donna Karan ensemble. 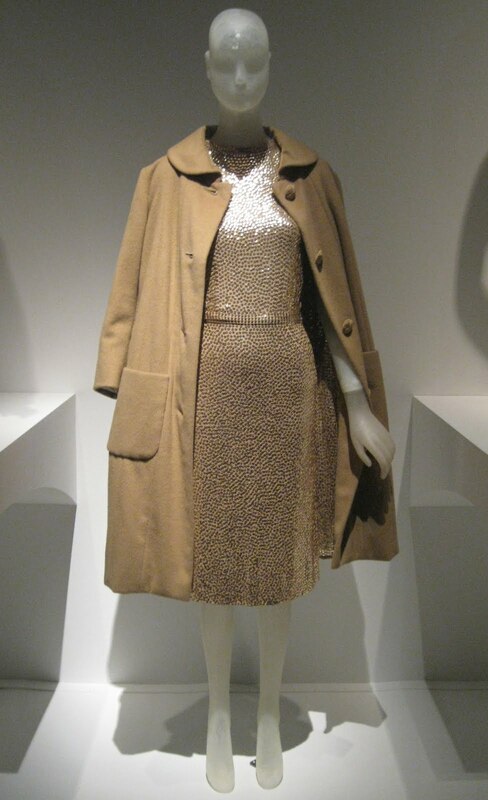 Norman Norell evening set, gold sequined camel silk jersey sheath dress and cashmere coat with sequined lining, circa 1958. Gift of Lauren Bacall. A 1971 Sidney Wragge dress. Left to right, a dress by Thakoon, a Yeohlee Teng ensemble, and a Proenza Schouler dress. A simple and lovely cream-colored dress by Halston from 1976. Oscar de la Renta silk taffeta gown with black Guipure lace jacket, Spring 2012. Detail of black Guipure lace jacket by Oscar de la Renta from his Spring 2012 collection. Oh JIll...thank you...I would have loved to have been at this and cover it...but having you do this for us is the next best thing! The advantages of living in New York..each designer picture and pictures of the styles was an enjoyment..great post! Were you there as press? What a thrilling collection of designers and such beautiful pieces. I shall probably dream of a sequined lined coat tonight.